Every day, day in and day out, even on weekends and holidays, I have to make sure that my family eats three times a day. This task is both wearying and satisfying. Why would I choose to read books about food yet? I can’t say, but I do know I love books about food. There is something deliciously satisfying about good food memoirs. They are pure comfort reading and I can hardly consume them fast enough. The Lifegiving Table by Sally Clarkson. Mennonites already have rich traditions centered around eating, so I didn’t find this book as overwhelming as some of Sally’s other books. I like her ideas on using intentional conversation starters while eating and having tea time discipleship. Her recipes for spaghetti pie and oatmeal muffins have been a hit here. Kitchen Counter Cooking School by Kathleen Flinn. Flinn got the idea to start a basic cooking class when she noticed how much processed food was going into grocery carts. I learned a lot, along with Flinn’s students, and was re-inspired to use simple ingredients and cook from scratch. Pandora’s Lunchbox by Melanie Warner. What’s in your hot dog or slice of American cheese?Did you know some vitamins are extracted from the oils in Australian sheep wool? Warner dishes on all the undesirable products stirred into processed food. Bread and Wine by Shauna Niequest. In this memoir, Niequest explores a lot of hard subjects through the lens of food. I also love seeing her hospitality in action. My Life in France by Julia Child. When Julia and her husband Paul moved to France for business, she knew nothing of the language or culture. But as she shopped at French markets and took classes at the Cordon Bleu, she fell in love with French cooking, and I couldn’t help being intrigued as well. Animal Vegetable Miracle by Barbara Kingsolver. Kingsolver’s mouthwatering descriptions of simple, local food are a joy to read. It made me want to shop at farmers’ markets, have a large garden, and raise poultry (and that last one is saying something!). Garlic and Sapphires by Ruth Reichl. 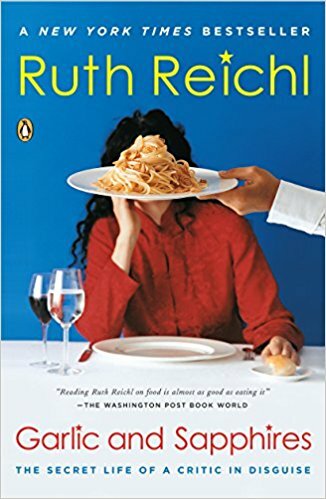 As the New York Time’s food critic, Reichl went to great lengths to disguise herself so that the service would not be skewed in her favor and she could give an honest review. I wouldn’t mind trying some of those $100 meals, but I have no desire to be part of the power-hungry upper class! Do you have a favorite book for foodies? Disclaimer: Although I enjoyed the sensory experiences within the pages of these books, I do not endorse the lives or views of the authors outside the kitchen. If you make a purchase through the links on this page, I may receive a small affiliate commission, at no additional cost to you.